The iconic 13.1 mile route begins in the middle of Newcastle on the central motorway where 50k+ runners will cross the starting line. Continuing down the A167 runners will pass Jesmond, Haymarket, Monument and Central Station before they arrive at the Newcastle side of the Tyne Bridge. As participants realise the uplifting experience of being cheered as they cross the Tyne Bridge from Newcastle to Gateshead they will be fast approaching the 2 mile mark. Having entered Gateshead and being welcomed by the shimming sight of The Sage, runners will be directed on the A184 to make their way towards Heworth. 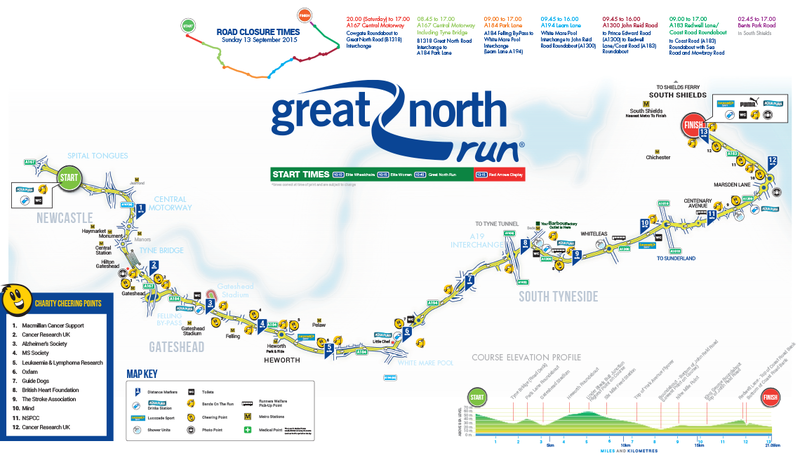 On route, runners will pass the renowned Gateshead Stadium as they approach mile 3 and will continue on the A184 until mile the beginning of mile 6 were they will be taken onto the A194. The A194 will bring runners into South Tyneside as they pass the A19 interchange at mile 8. Now on the A1300 participants will be taken passed Whiteleas and Centenary Avenue before they change on to the A183 just passed Marsden Lane at mile 12. Now on the home stretch in South Shields, runners will be welcomed by the view of the sea in one of the most scenic and enjoyable parts of the whole course. With just over a mile to go on Prince Edward road, runners will be cheered profusely as they make their way to the finishing gantry. Click here to view a larger version of the route.